(CNN) -- Former Beatles Paul McCartney and Ringo Starr will reunite on stage next month to raise money to teach transcendental meditation to children around the world to "help provide them a quiet haven in a not-so-quiet world," McCartney said. Paul McCartney (above) and Ringo Starr are teaming up for a fund-raising concert. The star-studded list of performers who will join them include two musicians who were with the Beatles when they journeyed to India's Himalayan foothills in 1968 to learn transcendental meditation from Maharishi Mahesh Yogi. "In moments of madness, it has helped me find moments of serenity," McCartney said in the concert announcement. Profits from the April 4 show at New York's Radio City Music Hall will fund the David Lynch Foundation's program, which has already taught 60,000 children around the world how to meditate, foundation spokesman Steve Yellin said. The goal of the project -- which is called "Change Begins Within" -- is to teach the meditation technique to a million at-risk children so they have "life-long tools to overcome stress and violence and promote peace and success in their lives," Yellin said. Schools across the United States have asked the group to bring the classes to their students, he said. 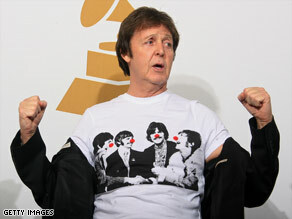 "I would like to think that it would help provide them a quiet haven in a not-so-quiet world," McCartney said. Singer-songwriter Donovan and musician Paul Horn, who studied at the Maharishi's ashram with the four Beatles, will also perform in the show. "How great to be playing with Paul, Ringo, and Paul Horn again -- as we did in India in 1968," Donovan said. "It's a real reunion after 40 years of Donovan, Paul Horn, Ringo and Paul McCartney," Yellin said. "It's quite an interesting thing that they are still talking about transcendental meditation." Ringo left the ashram after just 10 days -- explaining the food was too spicy for his taste -- and McCartney stayed for six weeks, according to journalist Lewis Lapham in his book "With the Beatles." McCartney and John Lennon wrote many of the songs for the Beatles' White Album while there, but the group disbanded within two years. The list of performers also includes Sheryl Crow, Eddie Vedder, Ben Harper, Moby, Bettye LaVette and Jim James. Tickets go on sale Monday, March 9, through Ticketmaster.